On Wall Street, Dow up 3.4 points at 11989 on weak economic and earnings reports. The Dow failed to close at 12k psychological barrier for a 2nd day amid weak economic data (rising weekly jobless claims and poor December durable goods orders) and mixed corporate results. Caterpillar reported bottom line that beat estimates but P&G, AT&T and Nokia reported below par corporate earnings. After the bell, Microsoft earnings topped estimates but Amazon profits fell sharply lower that consensus. Dow Jones Daily: Tug a War. The US Federal Reserve left the Fed Fund Rate unchanged at between 0% and 0.25% as expected, and reiterated that interest rates are likely to stay at the low level for an extended period. On economic growth, the Fed acknowledged that economic recovery is continuing, although the pace has not been strong enough to bring significant improvement to the labour market. On inflation, the Fed said underlying inflation was still “somewhat low” while inflation expectations have remained stable despite rising commodity prices. The Fed also decided to maintain QE2 of US$600 billion and stick to its initial plan to complete the programme by 2Q2011. continues to favour the emerging countries in view of the bias towards monetary tightening amid inflationary pressure. the total quantum of QE (QE1+ QE2) of US$2.3trn at least until early 2012. The Fed Vice President Yellen had also earlier mentioned that the Fed may take up to seven years to completely unwind the QE programme. The prolonged QE duration ensures plenty of liquidity support for all asset classes. Coupled with the pledge of liquidity support from the European authorities, we still expect incremental liquidity inflows into the emerging markets, catalysed by the interest rate and growth differential as well as prospects for regional currency appreciation. On Wall Street Recap, the Dow Jones ends flat after surpassing 12k level briefly. The Dow rose to 12020 (+43 points) following a more pro-business State of the Union address by Obama and a strong 18% jump in December new home sales to 329k (consensus: 300k). However, profit taking activities ahead of the FOMC statement reduced the gains to only 3 points at 11985. Fed said consumer spending picked up late in December, but growth “has been insufficient to bring about a significant improvement in labor market conditions”. It added that housing is “depressed,” employers are “reluctant,” and consumers are constrained by weak income growth, falling home prices and tight credit. On Wall Street, the Dow Jones surged 109 points to 11981, the highest since June 2008 on rising M&As (eg Rock-Tenn acquisition of Smurfit-Stone Container at US$3.5 billion and Novartis purchase of Genoptix at US$470 million) coupled with Intel’s US$10 billion share buyback scheme. To date, nearly 75% of the 84 S&P 500 companies that have reported results have beaten analysts' estimates. Key results and economic data slated for this week are 3M/January consumer confidence (January 25), FOMC statement/Verizon/Yahoo (January 26), Microsoft/Nokia/December Durable orders goods (January 27)and 4QGDP/January consumer sentiment (January 28). On Wall Street, the Dow rose another 51 points to 11838 (highest since mid 2008), after upbeat empire state index manufacturing data and a rescue pledge by European chiefs. These offset disappointing earnings from Citigroup Inc. and concerns about the health of Apple’s founder and CEO. After the bell, IBM and Apple share prices jumped following their better-than-expected earnings. Other key results announcements this week are Seagate/Wells Fargo/Goldman Sachs (January 19), Google/AMD (January 20) and Bank of America/GE (January 21). On Wall Street, the DJIA ended 84 points higher at 11755, a new 2-year high after a successful bond auction in Portugal and possible further strengthening of the Euro region’s bailout fund eased worries. Financial firms also led stocks higher Wednesday on hopes that banks would start raising their dividends this year. On the back of improving economic newsflow in US and Europe as well as anticipation of better 4Q2010 results, the Dow is likely to begin to head towards the 12000 points again and postpone the long overdue pullback after the reporting season. 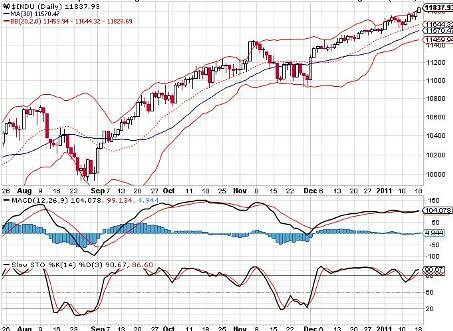 Immediate supports are 11667 (10-day SMA), 11599 (mid Bollinger band) and 11430 (lower Bollinger band) whilst resistance level is 11916 (weekly higher Bollinger band). Conservative investors prefer to use bonds investment as a primary investment tool to seek for steady and predictable income. They buy a bond when it is issued, keep and hold it until the maturity. In the meantime, they expect to receive regular coupon payments during the term. Once the bond investment term is matured, their investment principle is returned. Investors who have greater risk appetite may sometimes trade their bonds before they mature, particularly when interests rate fall. When bonds are issued at a high interest rate, the bonds become increasingly valuable when the interest rates fall. For example, a bond investor buys a bond for $5000 when the interest rate is at 5%. If the interest rate falls to 3.5%, new bonds will offer 3% interest rate. The older bond which pays 5% will become more valuable and hence more expensive. On the other way of saying, the bond’s price increases. Hence, this kind of bond’s capital appreciation can generate more return for bond trading investors rather than holding the bond investment into its maturity. Although bond investment can generate steady and predictable return, there are still some investment risks, namely, the interest rate risk, inflation risk, and default risk. When investors sell their bond before maturity when the interest rates have gone up, the price of the bond will go down to attract buying interest, and eventually incur a capital loss. This is because new bond investors can buy new bonds that offer much higher interest rate. Interest rate risk is one of the three major risks that bond investors face. Since the dollar amount investors receive on a bond investment is fixed, the value of those dollars could be eroded by inflation. For example, at inflation of 2%, $100 received in 10 years’s time is worth just $82 today. That’s a loss of $18. In general, the longer the term of a bond investment, the higher would be the interest rate offered to make up for the risk of tying money up for a longer period. This is the risk that the borrower fails to pay investors coupon payment and principle. Bond investment is one of the best investment options for conservative investors. Its return is steady, predictable and less volatile. However, it is not risk-free. Therefore, being as a wise investor, we may diversify our investment portfolio into different classes of investment assets. On Wall Street, the Dow Jones up 34 points to 11672 points after falling for three straight days, as Japan's pledge to buy Eurozone bonds helped ease European debt jitters. Sentiment was also helped by strong earnings forecasts from major retailers and an earnings upgrade to Hewlett-Packard. Major corporate earnings release this week are Intel (Jan 13)and JP Morgan (Jan 14). we believe Dow is slated for further profit taking consolidations as the 4Q2010 reporting seasons begin. 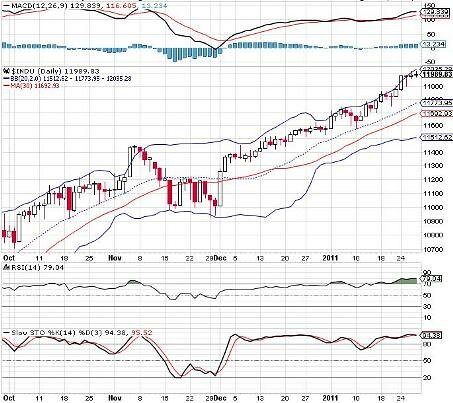 Immediate supports are 11585 (mid Bollinger band) and 11424 (lower Bollinger band) whilst resistance level is 11745 (higher Bollinger band). On Wall Street, the Dow Jones tumbled as much as 100 points intraday as concerns over the euro zone debt crisis dampened the appetite for risk ahead of a flurry of bond auctions. However, it managed to narrow the losses to 37 points in anticipation of a strong Alcoa 4Q2010 results and M&A news, including Duke Energy’s US$13.7 billion acquisition of Progress Energy, a tie-up that will create the country’s largest utility as well as DuPont’s agreement to buy Danisco, a Danish specialty food ingredients maker, for US$5.8 billion. After the bell, Alcoa earnings beat estimates and offers an improving outlook for 2011. Other major earnings releases this week are Pfizer (Jan 11), Intel (Jan 13) and JP Morgan (Jan 14). We reiterate that Dow is slated for further profit taking consolidations as the 4Q2010 reporting seasons begin, accompanied by weakening technical indicators as the 10-day SMA of 11640 was broken. 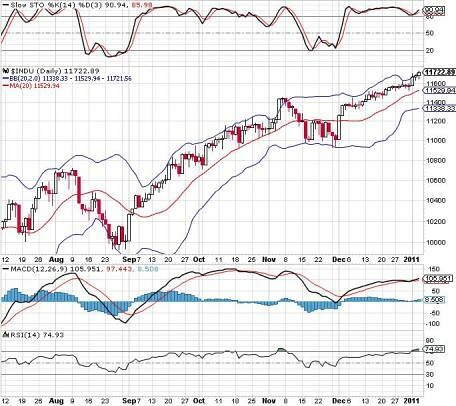 Immediate supports are 11572 (mid Bollinger band) and 11404 (lower Bollinger band) whilst resistance level is 11741 (higher Bollinger band). Consolidations Continue For Dow Jones. Dow down 22 points on weak job data and the court ruling on foreclosure case (Wells Fargo and US Bancorp), sparking a sell-off in bank stocks. Sentiment was also dampened by the Dec 10’s nonfarm payrolls growth of 103k, rising from an upwardly revised 71k in November but below consensus 150k. Nevertheless, unemployment rate fell to 9.4%, lowest in more than 1-and-a-half years. in 2011 than it was in 2010. Following two consecutive decline in Dow amid rising jobless claims and weak job data, we expect more consolidation ahead as the 4Q10 reporting season begins. 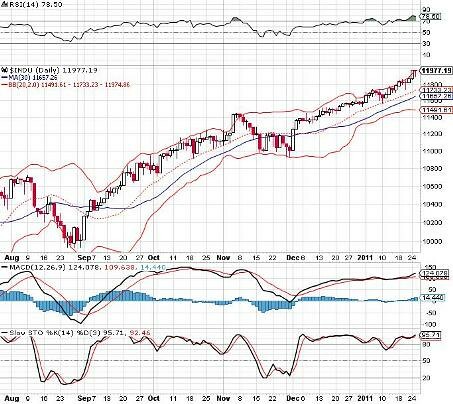 Immediate resistance level is 11906 (upper weekly Bollinger band) whilst support level is 11561 (middle Bollinger band) and 11362 (50-d SMA). On Wall Street, ahead of the key job report this Friday, the Dow Jones rose 32 points to a new 2-year high of 11,723 on 3rd consecutive days, as investors braced for strengthening economic reports. The private sector ADP payrolls soared by 297k in December 2010 against November 2010’s 92k and above consensus 100k. Meanwhile, the December 10’s ISM activity in the service sector picked up to 57.1, topping consensus forecast of 55.6 and above 55 in November 10. With the Dow Jones expanding Bollinger bands as well as the strengthening economic data and ADP reports, there could be more upside ahead in anticipation of an improving December 2010’s job data (January 7 release). 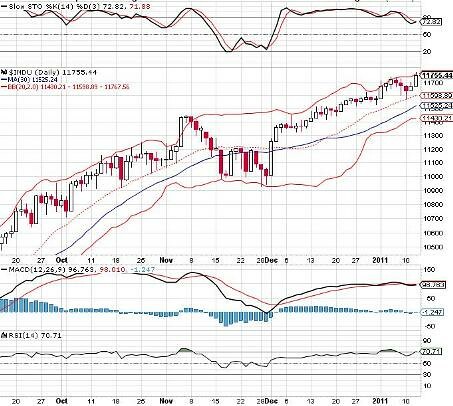 Immediate resistance level is 11916(upper weekly Bollinger band) whilst support level is 11530 (middle Bollinger band). 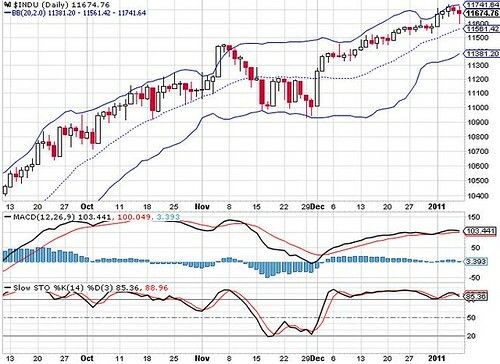 Daily Dow Jones' bollinger bands are expanding again to indicate more upside potential. On Wall Street, ahead of the key job report this Friday, the Dow ended mixed on profit taking despite a good set of economic data, with a mild gain of 20 points to another fresh 2-year high at 11691, as profit- taking emerged following a 6.2% surge since end November 2010. Investors shrugged off positive data from a robust 0.7% jump in November 2010 factory orders and a sharp rise in monthly sales from General Motors and Ford, as Fed signals that economic growth were not enough to cut back its $600 billion bond-buying program. We reiterate our view that the Dow will continue to witness more volatility ahead of the key December 2010’s job report (January 7) and the forthcoming 4Q10 reporting season (in two weeks time). 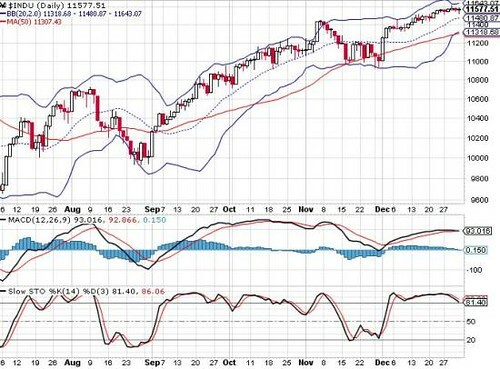 Immediate resistance level is 11870 (upper weekly Bollinger band) whilst support levels are 11512 (middle Bollinger band) and 11329 (50-d SMA). Investor can buy physical gold bars in different weights ranging from 1 gram to the popular kilobar (32.15 troy ounces), or to the international “London Good Delivery” bar (400 troy ounces). Gold coins are legal tender in the country of issuance and their gold content is guarantee. The bullion coin bears a face value that is largely symbolic. Its true value depends on its gold content and its numismatic value (or collector’s value). One disadvantage of buying physical gold is that you would have to pay some sales tax or administration fees for bank’s safekeeping. For investor who does not want to hold physical gold, invest in gold certificates is another alternative especially for those who want to invest gold in large amount of money. The investment in gold certificates is usually one kilobar each, up to a maximum of 30 kilobars. There is no sales tax on gold certificates. Gold certificates can easily be exchanged for physical gold or cash. The gold is kept in the bank’s vault, and may incur some administration charges. Investors can buy and sell gold through a passbook at prevailing market prices. Gold savings accounts allow those gold investors who want to trade frequently to buy and sell gold in a unit of 1gram lots. Investors who have a greater investment risk appetite can choose to invest in the gold market by buying stocks in gold mining firms. The capital appreciation potential of a gold share is depend on the future price of the gold, and also on the future prospects of the company, based on its management and operating strengths. Where these companies make the most is exploration, but that is also where one finds the higher risks. Some of the most established gold mining companies in the world are found on the New York Stock Exchange, NYSE. Barrick Gold Corporation is the largest gold producer company in the world, followed by the world's second-biggest miner Newmont Mining Corporation. Investors who invest in gold unit trust are buying general industry and market risk instead of company-specific risk. Gold funds diversify their holding among dozens of companies. An example of a gold unit trust fund portfolio consists of about one-third of the fund is typically in base metals such as iron, ore and copper, and about two-thirds are in gold and precious metals. Another way to invest in gold is through the streetTRACKS Gold Trust (Symbol: GLD), where investor’s ETF (Exchange Traded Funds) shares can be bought and sold at anytime. The ETF is benchmarked to spot gold, which means that it is as good as buying physical gold, minus the fund’s expenses, and the transaction cost involved is lower than the cost of buying and safekeeping physical gold. Gold futures and options are traded on established exchanges around the world. At COMEX (New York Commodity Exchange, the leading U.S. exchange for metals futures and options trading), for example, each gold futures contract is for 100 troy ounces of not less than 0.995 fineness, and bears a serial number and the identifying stamp of a refiner approved and listed by the Exchange. Wall Street kicked off 2011 with a bang, Dow Jones soars 0.8% amid positive economic data, the Dow climbing +93 points to a fresh two-year high at 11671, as strong reports on manufacturing (expanded for a 17th straight month and the fast pace in seven months) and construction spending stoked optimism about the economy. The December 10’s ISM index edged up to 57 (consensus: 57), up from 56.6 in November whilst the November 10’s construction spending data rose 0.4% (consensus: +0.2%), following a 0.7% rise in October. Economists were looking for an increase of 0.2%. 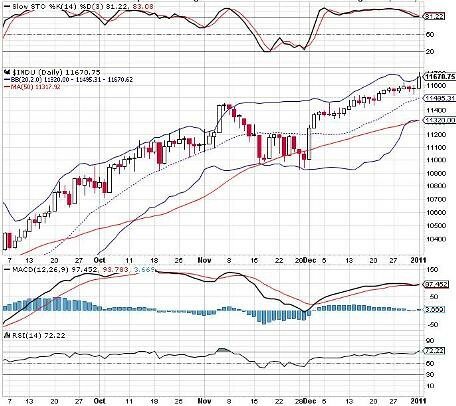 Despite the overbought position, the Dow Jones continues to scale new heights, driven by the strengthening economic data, which has postponed the long overdue profit-taking consolidation. Having said, we reiterate our view that the Dow will continue to witness more volatility ahead should the key Dec 2010 jobs report (due January 7) and the forthcoming 4Q2010 reporting season (in two weeks time) fail to meet market expectations. 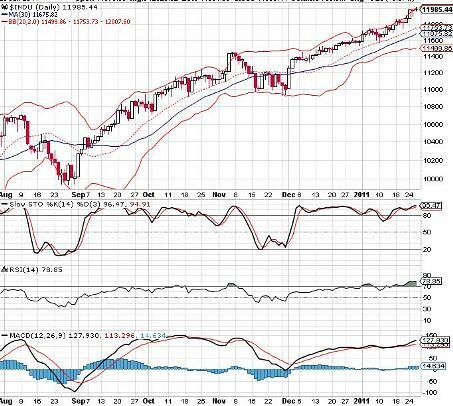 The immediate resistance level is at 11870 (upper weekly Bollinger band) whilst support levels are 11495 (middle Bollinger band) and 11318 (50-d SMA). 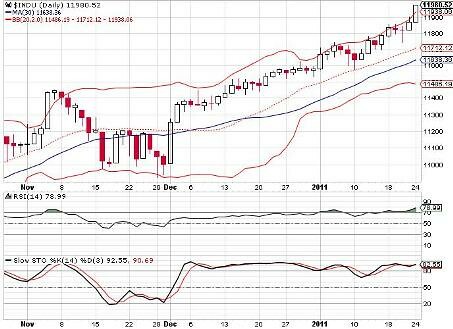 Daily Dow Jones to stays at crucial support at middle bollinger band to sustain further upside. The Dow Jones ended flat last Friday at 11,578, to close 11% for the year 2010 following stimulus measures from the Federal Reserve and the government which translated into signs of economic improvement. In the absence of economic news and corporate announcements, Wall Street was relatively quiet during the entire holiday week, as many investors had already closed their books out in previous trading sessions. Crude oil, meanwhile, rebounded from early losses and rose $1.54 to $91.38. Gold rose $15.50 to $1,421.40. We see more near-term profit taking in the US equities, which we believe have been overbought. Also, the reporting season for 4Q2010 kicks off on two weeks’ time. Moreover, a repeat of last month's disappointing U.S. jobs number could spark a sell-off. Key economic reports slated for this week are December ISM (Jan 3); November factory orders (January 4); December ADP employment & December Ism non-manufacturing (January 5); December Job data (January 7). 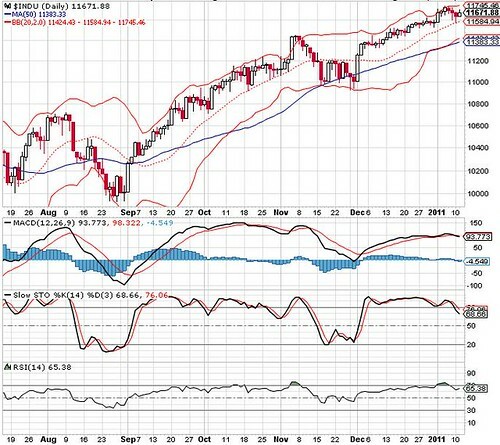 Immediate resistance levels are 11643 (upper daily Bollinger Band) and 11870 (upper weekly Bollinger band) whilst support levels are 11480 (middle Bollinger band) and 11307 (50-d SMA) points.